This post is sponsored by The Mushroom Council. Mini Bell Pepper Nachos with Avocado Cream. Oh me oh my, this sheet pan game-day appetizer or weeknight dinner is sure to please your hungry crowd. 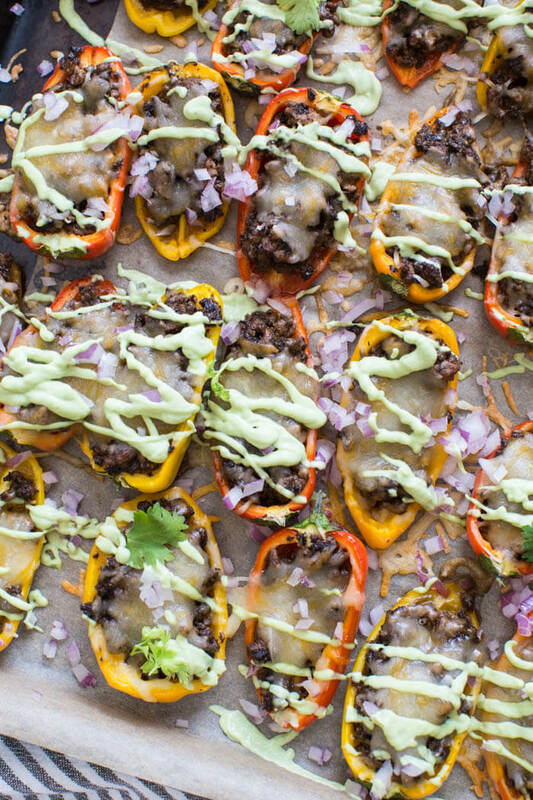 It’s a stuffed pepper meets nacho lovers dream… especially with cool avocado cream drizzled on top! Or if you’re like me you’ll take your nachos with a large side of avo cream. 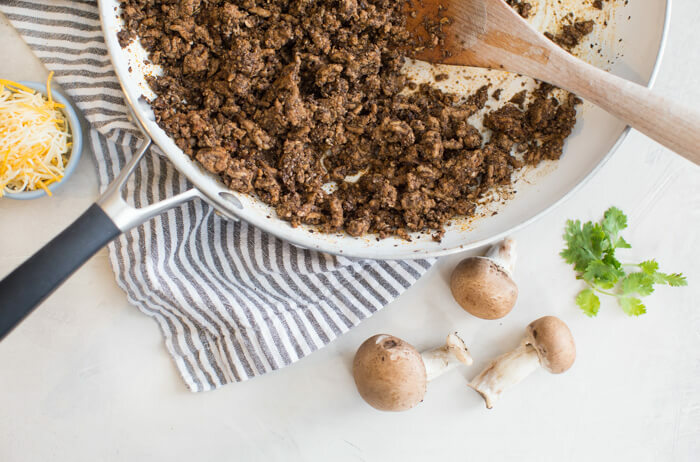 This lower carb veggie forward dish satisfies with a blend of beef and mushrooms. Mushrooms give that “umami” flavor, added moisture, and of course plant power. You can still have your tortilla chips hubs, but I think you’re going to LOVE me for these Mini Bell Pepper Nachos because the flavor is on point and avocado cream. He’s an onion fan and I’m all about those mushrooms, he knows I add them to eeeerthing. Can’t stop won’t stop, can’t ever have enough. 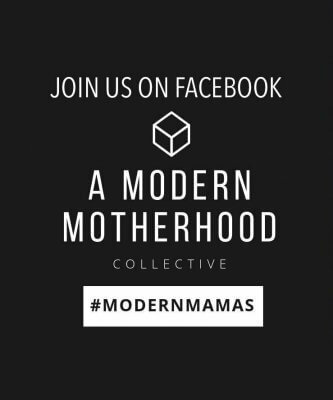 Mushroom lovers unite! DYK– Mushrooms are the only source of vitamin D in the produce aisle and one of the few non-fortified food sources. Brain food. And for those science geeks like me… all mushrooms contain some vitamin D, but growers also have the ability to increase D levels by exposing mushrooms to ultraviolet light. Similar to humans, mushrooms naturally produce vitamin D following exposure to sunlight or a sunlamp: mushrooms’ plant sterol – ergosterol – converts to vitamin D when exposed to light. So I’d love to know, what are you serving on game day this weekend? Mini Bell Pepper Nachos with Avocado Cream? You say nachos and I’m there. 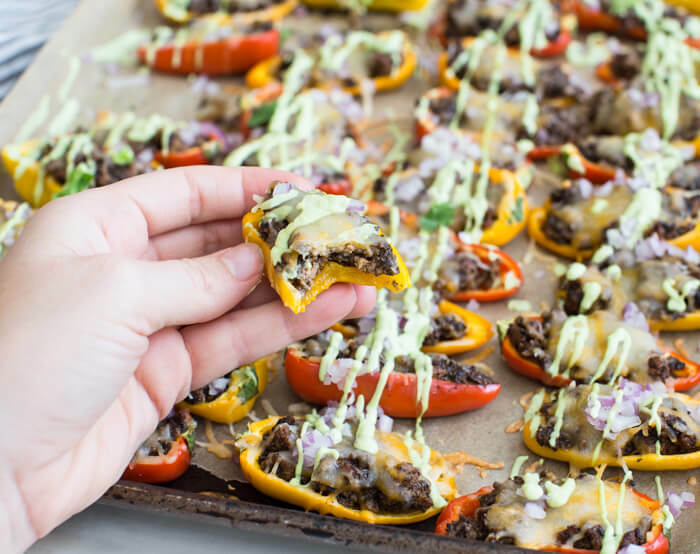 Mini Bell Pepper Nachos with Avocado Cream made on a sheet pan. 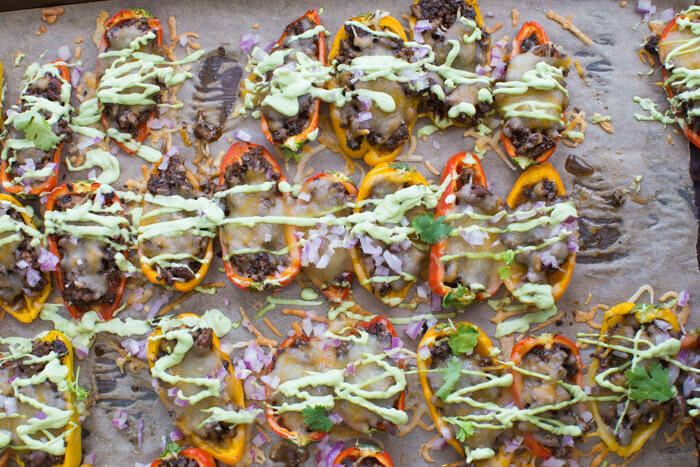 Stuffed pepper meets nacho lovers dream… especially with cool avocado cream drizzled on top! 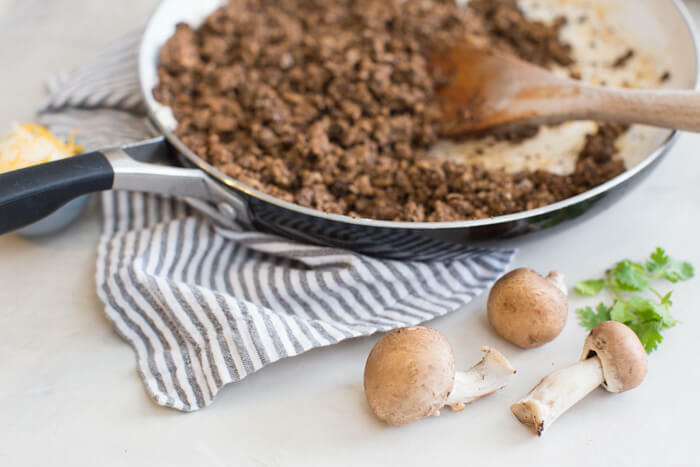 In a large food processor, add mushrooms process until small chop or minced. 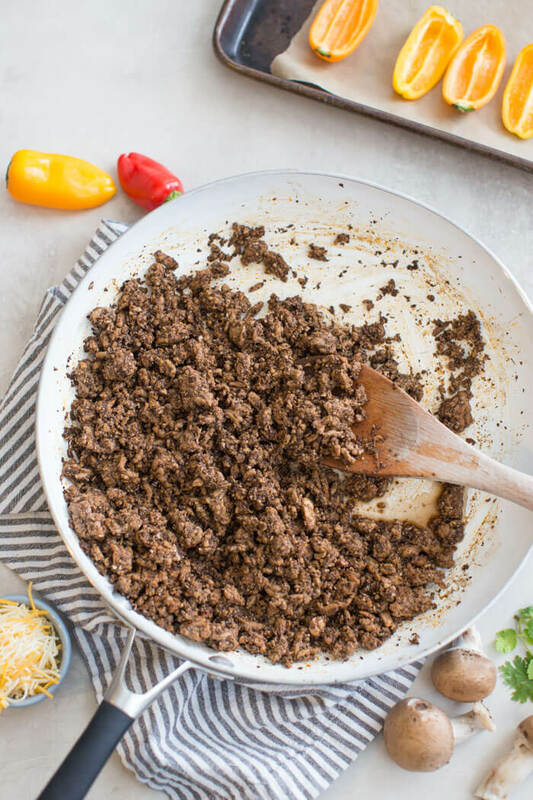 In a large saute pan, cook ground beef over high heat until brown; add taco seasoning to coat beef. Stir in mushrooms; remove from heat. 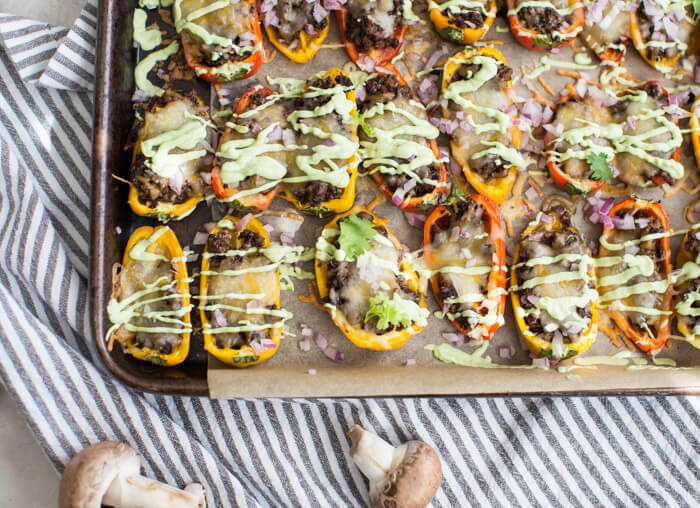 Place mini pepper halves on baking sheet, and stuff each with beef and mushroom blend. 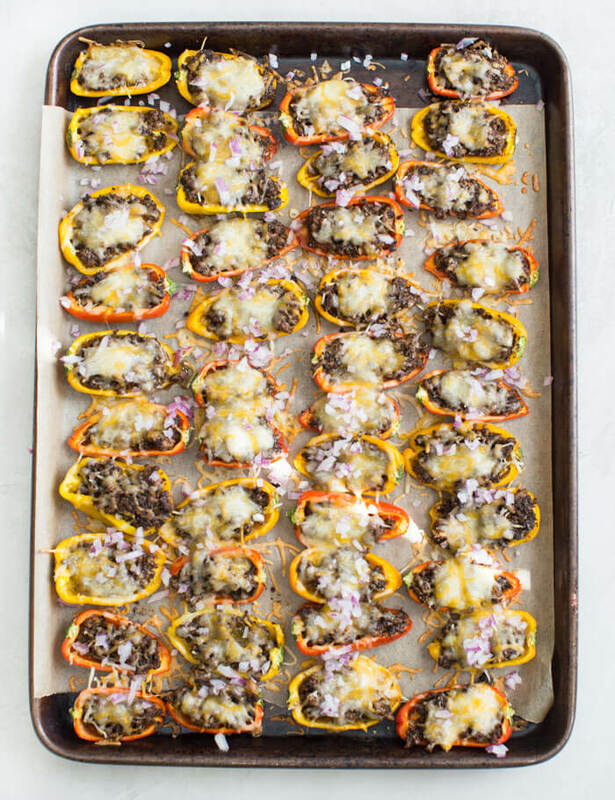 Top each pepper with cheese; bake for 15 minutes. In food processor, add avocado, lime juice, sour cream, and jalapeno (if using); process until smooth and creamy. Once nachos are done baking, garnish each with red onion, avocado cream and cilantro. Enjoy! 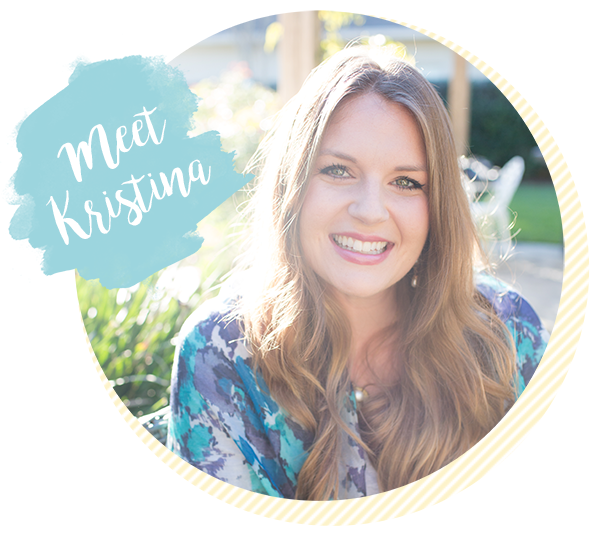 « What is a Plant Based Diet? I bet the avocado cream kicks it up a notch! I think this will be a huge hit with the kids. 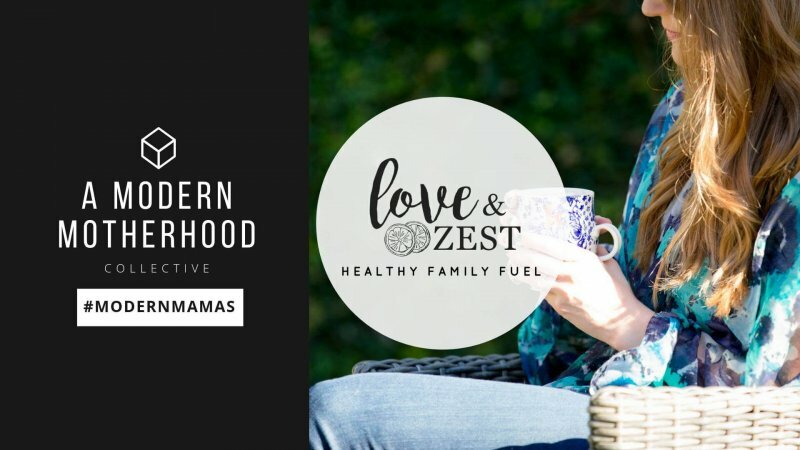 LOVE that mushroom blend! That’s a great idea to make sheet pan nachos with it! Pinning! My consumption of tortilla chips has gotten seriously out of control. I think I need to try these instead – they look so tasty! 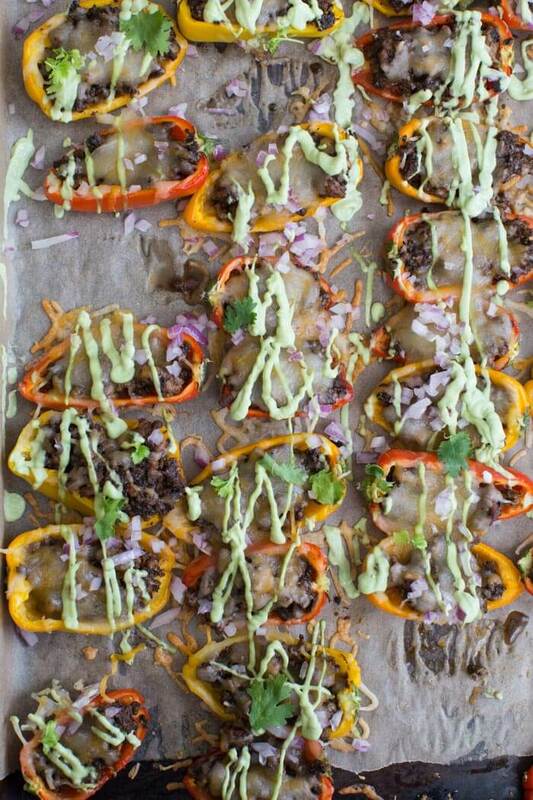 These mini bell pepper nachos sound yummy and healthy. Love that combo! That avocado cream sauce is perfect for this dish!